These top wealth recipients - let's call them the One Percenters - took for themselves close to 44 percent of all income in New York during 2007 (the last year for which data is available). That's a high bar for wealth concentration; it's almost twice the record-high levels among the top 1 percent nationwide, who claimed 23.5 percent of all national income in 2007, a number not seen since the eve of the Great Depression. During the vaunted 2002–07 economic expansion - the housing-boom bubble that ended in our current calamity, this Great Recession - average income for the One Percenters in New York went up 119 percent. Meanwhile, the number of homeless in the city rose to an all-time high last year - higher even than during the Great Depression - with a record 113,000 men, women, and children, many of them comprising whole families, retreating night after night to municipal shelters. But here's the most astonishing fact: the One Percenters consist of just 34,000 households, about 90,000 people. Relative to the great mass of New Yorkers - 9 million of us - they're nobody. Between 2007 and 2009 alone, Mike Bloomberg's fortune increased from $5.5 billion to $16 billion, a leap that made him jump 125 spots from #142 to #17 on the Forbes list of the richest people in the world. He has $3.5 billion more now. In fact, Bloomberg is so rich (how rich is he?! ), he has more than two-and-a-half times as much net worth than Rupert Murdoch ($7.4 B) and is richer than former Google CEO Eric Schmidt ($6.2 B), Donald Trump ($2.9 B), Oprah Winfrey ($2.7 B), and the late Steve Jobs ($7 B) combined. 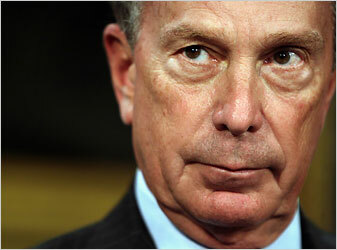 Mike Bloomberg has so much money, he is out of touch with over 99.9% of the 1% of wealthiest Americans. In March 2008, Bloomberg opposed a proposal by "Democratic Assembly members to raise income taxes by 12% on residents making more than $1 million a year" which "would raise $1.5 billion in state revenue a year," saying, "I think at this point, where we're in competition with other cities around the world for entrepreneurs and the best and the brightest, it's not the time to be raising taxes." City officials also plan to try to lure big banks and financial companies from Asia and elsewhere to set up operations in New York, filling some of the void created by the implosion of large American firms like Lehman Brothers and Bear Stearns. They hope the federal and state governments will let them use $30 million in federal money to attract those companies and other financial firms to Lower Manhattan. To head off criticism that the city is providing assistance to people who were paid large sums to work in a business whose excesses caused a global financial crisis, the mayor said that "these job losses affect people in a wide range of professions and income levels." As usual, for Bloomberg, the innocent victims in desperate need of government aid are the Wall Street bankers themselves. "You know, the yelling and screaming about the rich - we want rich from around this country to move here. We love the rich people." In February 2010, Bloomberg used his weekly radio show to promote more and bigger Wall Street bonuses. "If you don't pay bonuses, we can't tax it," he said, adding, "Cops, firefighters, teachers, all municipal workers should be down there screaming, 'Pay Wall Street people more!' That's where their salaries come from." A couple of months later, as President Barack Obama toured the country paying lip-service to financial reform, the Associated Press quoted Bloomberg as saying, "The bashing of Wall Street is something that should worry everybody...We're on their side." He reiterated his position on increased taxes on huge Wall Street bonuses with this gem: "If you want to worry about a few guys that got big bonuses, let me tell you, they will find someplace to work in this country or elsewhere. Those people bring in business. That's why they get paid those bucks." And now, as Bloomberg rolls his eyes at the Occupy movement, his girlfriend Diana Taylor sits on the board of Brookfield Office Properties, the massive real estate corporation that owns Liberty Plaza. Whether or not there are any legal grounds for either the Bloomberg-controlled NYPD to attempt to shut down the peaceful, non-violent occupation or for Taylor and the Brookfield board to clear and close the park is debatable. Bloomberg's veneration of wealth and Wall Street has since been repeated as a right-wing talking point in attempts to discredit and malign the protesters and their supporters. This past week, Republican presidential front-runner and former pizza king Herman Cain dismissed millions of unemployed, disaffected and disillusioned Americans by commenting, "Don't blame Wall Street, don't blame the big banks, if you don't have a job and you're not rich, blame yourself. It is not someone's fault if they succeeded, it is someone's fault if they failed." The millionaire favorite of the fake-grassroots, corporate-backed Tea Party called the protests "un-American" and "anti-capitalism" and told The Wall Street Journal, "I don't have the facts to back this up, but I happen to believe that these demonstrations are planned and orchestrated to distract from the failed policies of the Obama Administration." Meanwhile, Tea Party enthusiast millionaire Eric Cantor described the Occupiers as "growing mobs" and millionaire Mitt Romney called them "dangerous." "[W]e have to be careful not to allow this to get any legitimacy. I'm taking this seriously in that I'm old enough to remember what happened in the 1960s when the left-wing took to the streets and somehow the media glorified them and it ended up shaping policy. We can't allow that to happen." Of course, the crazy 1960s policies shaped by the anarchist left-wing that King derides include the Civil Rights Act of 1964 (the sweeping anti-discrimination and desegregation legislation), the Voting Rights Act of 1965 (prohibiting discriminatory voting practices), Lyndon Johnson's Executive Order 11246 (requiring "Equal Employment Opportunity") the same year, the Supreme Court's unanimous ruling on Loving v. Virginia (which "requires that the freedom of choice to marry not be restricted by invidious racial discriminations"), and the Civil Rights Act of 1968, otherwise known as the Fair Housing Act. If King had his way, perhaps the Vietnam War would still be raging. In their effort to impugn and vilify Occupy Wall Street, Republicans seem to be forgetting their own (opportunistic) populist rhetoric of just three years ago. In mid-September 2008, at a Florida rally during the homestretch of the presidential campaign, John McCain said, "This foundation of our economy, the American worker, is strong but it has been put at risk by the greed and mismanagement of Wall Street and Washington. Government has a clear responsibility to act in defense of the public interests, and that is exactly what I intend to do. We are going to make sure that American's accounts are protected." Later in his speech that day, McCain declared, "When any Wall Street operator abuses the trust of the public, then they will face the consequences, and they will have a fight on their hands with the President of the United States." To say such things these days (whether he believes them or not) would mark McCain - or anyone else for that matter - as an anti-American, success-punishing, Anarcho-Islamo-Maoist enemy of the free market, and of liberty in general. And yet, despite such attacks, Occupy Wall Street continues to grow and galvanize, demonstrating on a daily basis that it is on the right side of history and police barricades. The nascent movement, less than a month old, is expanding faster and organizing stronger than terrified pundits and politicians can denounce or dismiss it. Complacency is being replaced by commitment and connectedness. Its message that there is a better way forward, one more equitable and just, reminding ourselves and our government that We - not corporations - are the People, is reverberating, collectively amplified a few words at a time, across the country and around the world. Mayor Michael Bloomberg said on Monday that he’ll allow the Wall Street protesters to stay indefinitely, provided they abide by the law, marking his strongest statement to date on the city's willingness to let demonstrators occupy a park in Lower Manhattan. "The bottom line is – people want to express themselves. And as long as they obey the laws, we’ll allow them to," said Bloomberg as he prepared to march in the Columbus Day Parade on Fifth Avenue. "If they break the laws, then, we’re going to do what we’re supposed to do: enforce the laws." Bloomberg said he has "no idea" how much longer the Wall Street demonstration will last. "I think part of it has probably to do with the weather," he said. October 13, 2011 - Just two days after uber-billionaire baron Bloomberg made his announcement that OWS protesters could stay in Liberty Plaza "indefinitely", the mayor visited the Park and soon thereafter released a statement regarding a pathetically transparent initiative by Brookfield Office Properties to temporarily clear out all protesters early Friday in order to clean the park. The statement, issued by Bloomberg's Deputy Mayor for Operations Cas Holloway, claimed that "the last three weeks have created unsanitary conditions and considerable wear and tear on the park." This claim echoes a letter sent by Brookfield to NYPD Commissioner Ray Kelly on Tuesday which cited "health and public safety issues" and declared that "conditions at the Park have deteriorated to unsanitary and unsafe levels." The letter also noted that "numerous laws [are] being broken including but not limited to lewdness, groping, drinking and drug use, to the lack of safe access to and usage of the Park, to ongoing noise at all hours, to unsanitary conditions and to offensive odors." Anyone who has visited Liberty Plaza knows this is not true. On October 6, New York State Senator Daniel Squadron and State Assemblyman Rory Lancman wrote a piece for The Huffington Post in which they praised the protesters for having "focused the world on the frustration felt by millions," identified Occupy Wall Street's core issues as "accountability on Wall Street for the financial crisis that tanked the global economy; shared sacrifice as we pull ourselves out of an economic mess that the middle class and working poor didn't create; and a political system controlled by people, not corporations," and outlined a few ways local and state government can respond positively through policy to address these demands. Additionally, thirteen City Council members have written a letter opposing the looming eviction and calling upon the mayor to "respect the deep traditions of free speech and right of assembly that make this a great, free, diverse, and opinionated city and nation." During a press conference across the street from the park, Margaret Chin, the City Council member whose district includes Wall Street, said, "I call on the mayor to do everything you can to make sure the peaceful demonstrations continue." Jumaane Williams, a Brooklyn Council member, addressed his comments to the mayor. "Hopefully you'll be remembered for something other than dismantling democracy in this city," he said. Meanwhile, Congressman Jerry Nadler, who represents New York's eight district where the park is located, wrote in press release, "The City has an obligation to maintain public order, but it also has an obligation to respect the right to speak, to protest, and to petition the government for redress of grievances. Apart from the requirements of the Constitution, New York City has long been home to political protests of all kinds. The City should respect that tradition, and our core constitutional values, by working with Occupy Wall Street to ensure that they may continue their important work." Whereas Bloomberg's spokesman Holloway also said the cleaning “will be done in stages and the protesters will be able to return to the areas that have been cleaned provided they abide by the rules that Brookfield has established for the park,” these new rules - unilaterally declared today by Brookfield - serve to effectively end the occupation by prohibiting "camping and/or erection of tents or other structures; lying down on the ground, or lying down on benches, sitting areas or walkways...; the placement of tarps or sleeping bags or other covering on the property; storage or placement of personal property on the ground, benches, sitting areas or walkways" and other such "rules" that, if enforced, would clearly and effectively put an end to the protest. Unsurprisingly, such a transparent tactic has been met with tireless efforts by the occupiers to clean the park themselves (which they already do on a regular basis), challenge the new ordinance legally [PDF], and a steadfast refusal to leave. An all-too-perfect metaphor for the gaping chasm between the OWSers and the mayor played out this evening. As every inch of Liberty Park was being scrubbed, mopped, and cleaned by protesters under the threat of imminent eviction, Bloomberg was attending a gala dinner reception just blocks away at the swanky Wall Street restaurant, Cipriani Club 55. When hundreds of protesters "attempted to deliver the mayor a petition with 310,000 signatures supporting their right to remain in the park...the mayor refused to come out of the restaurant, instead making his exit out of a back door," the Daily Mail reported. On Countdown with Keith Olbermann tonight, Rage Against the Machine's Tom Morello had this to say about Occupy Wall Street, where he had performed earlier in the day: "First it was completely ignored, then they got pepper sprayed and New York City found out about it. Then 700 of them got arrested on the Brooklyn Bridge and the country found out about it. Now there's over 1,000 Occupies around the country and around the world." "I'm not sure what's gonna happen, but that's good because it feels like anything can happen," he said later in broadcast. "It doesn't feel like this thing has a roof, it doesn't have a ceiling, like anything is possible." Regardless of what happens tomorrow morning, in the rain on the corner of Broadway and Liberty, Occupy Wall Street will win and Bloomberg will lose. So, it's your move, Mike. Checkmate.